On Saturday, varsity girls' lacrosse defeated Edison 18-15 at home. Trailing 3-0 early in the game, the Knights launched a sustained attack to win the game. Leading the scoring was sophomore Amelia Kirby, who accounted for 11 goals and one assist. 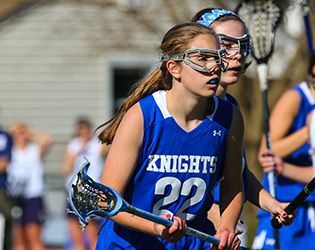 In addition to helping her team to the win, Kirby set a new girls' lacrosse record for goals in a single game. The talented junior captain, Emma Dean, chipped in with three goals and two assists and junior Mikaela Gegelys added two goals. The remaining two goals came from sophomore Amanda Weiss and freshman Andree Aloise. In the cage, sophomore Katherine Lioudis fended off just over 50 percent of the shots on goal to secure the win for the Knights. Asked about the game, head coach Janet Holdsworth said, "Amelia’s effort was an integral part of the win; she has been an attacking force for us the entire season. But it was a total team effort across the field. I was extremely proud of the girls for coming back from an initial three-goal lead by Edison, and then, holding onto the lead – despite being exhausted – for the rest of the contest. The girls bring everything they have to each matchup. "